Everybody thinks their own horse is special, and some of the big international jumpers have quite a following, but it’s pretty special to see a hunter who attracts the attention and fan base Brunello does. Every time he goes in the ring (which, at 17-years-old, is not often—he showed once at the Blowing Rock Charity horse show [N.C.] before coming to the USHJA International Hunter Derby Championships), a gaggle of barn kids and fans wait at the in-gate to shower him in pets and carrots when he walks out. The whole place gets quiet as Liza Boyd guides “Ike” through the in gate, and a couple of his extra impressive efforts at the bigger oxers in this year’s derby elicited gasps from onlookers. 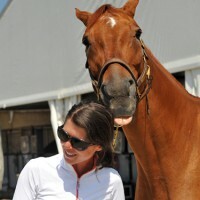 By far the loudest cheering occurred after Ike and Boyd landed from the final oxer in the second and final handy round of the USHJA International Hunter Derby Finals—Boyd looked as if she was going to forget to ask the big, lithe red horse to walk, she was so busy enthusiastically petting him and running her hands up and down his neck. Boyd knew she was sitting on something special, and the judges thought so too. For an unprecedented third year in a row, Boyd and Ike took the top spot at the championship. The Chronicle went behind stall doors with the pair at the Kentucky Horse Park the morning before their win to see what makes this champion tick. The first thing you notice when you find Ike’s stall at Boyd’s Finally Farm tent barn at the Kentucky Horse Park are the walls. They are covered all the way around with black mats, not unlike those used for a padded room. Ike is also not stalled next to anybody else—he’s in a corner stall facing the Rolex Stadium, with the feed stall next to him and the tack stall behind him. At first, I think Boyd is just being extra cautious, but she’s actually more worried about what Ike would do to other horses given half a chance. Brunello is cuddly with humans, but those black stall pads are necessary because he’s very much opposed to being close to other horses. “I always tell the story of when we were here for the [derby demonstrations at the Alltech FEI World Equestrian Games], they had to be in stalls beside each other,” Boyd said. A selection of top derby horses performed at the 2010 World Equestrian Games in Lexington, Ky., to showcase the USHJA derby program, and Boyd was one of them. Even at Boyd’s Camden, S.C., home barn, not a single horse has gotten itself in Ike’s good graces. He enjoys padded living quarters there as well, but Boyd said the wood he can reach has scratches and marks all over it from Ike sliding his teeth. Ike’s grumpy face comes when he’s annoyed by another horse in his personal space. “He body slams, and he’ll pin his ears straight back, and he’ll slide his teeth back and forth back and forth. It’s more too if people are around, and another horse comes up. He’s like, ‘Those are my people.’ He would never ever hurt a person, though, and he’s super in the schooling area. At USHJA International Hunter Derby championships (which Boyd said Ike is horrible to ship to, because, you know, other horses anywhere near him) Ike’s warm-up routine starts with a 1.30-meter jumper class on the Wednesday before Friday’s opening classic round. It’s a trick Boyd estimates she has been doing for three or four years now to sharpen Ike up for the biggest two days of their year. Boyd doesn’t try to win her warm-up jumper class either—in fact, she gets eliminated every year she does it for making up her own course, practicing handy turns and avoiding things like the liverpool that she wouldn’t see in hunter competition. “I wasn’t sure if I was going to do the triple or not, but I thought I just need something to sharpen him up a little bit. Then I did the triple and I don’t think I used quite enough leg, a little bit on purpose, and he had to really make a big effort. The next piece in Ike’s derby prep puzzle is a morning hack from Liza’s father, Jack Towell. Ike starts his day with groom Alberto Ramirez (whom Liza introduces as Ike’s best friend), who feeds him breakfast at 5:30 a.m., which consists of Platinum Performance grain and hay, brought from home and soaked. Ike and his best friends, rider Liza Boyd and groom Alberto Ramirez. The last thing Boyd does at the end of every show day, and for much of the day prior to the night’s big handy class, is spend some quality hand-grazing time with her big red buddy. “Every night, it’s just been Ike and I. It’s usually just supposed to be 30 minutes, and then I look down and its like ‘Wow, its been an hour, I need to go get food!’” Boyd said with a laugh. “It’s kind of therapeutic at the end of the day just to hang out with him.